Distances less than 100km from Hythe, Alberta - $.85/kilometer return from Hythe, Alberta. Distances greater than 100km from Hythe, Alberta - $.85/kilometer return from Hythe, Alberta + $30 extra charge for every additional 100km return from Hythe. Course can be cancelled, up to 16 hours before class starting time, without any penalty. If cancelled, within 16 hours, then a flat fee of $400 will be charged. This fee however, will be deducted from the next bill, if another course is booked and completed. Learn to avoid unwanted bear encounters and how to handle them effectively when they do occur. Bear statistics - Facts and figures of approximately 80% of all bear attacks, injuries or deaths in North America. What worked and what did not. 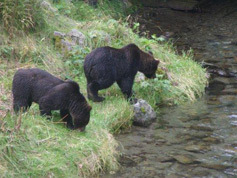 Avoidance of bear encounters when hiking, camping and working in bear country. Black bear versus grizzly encounters. Identification of each bear species in North America. Defensive aggressive attacks versus offensive predator bear attacks. Statistics on playing dead or fighting back and when/whether to consider each strategy. Defensive weapons such as bear spray, bear bangers, guns, knives and other objects. Good statistics on what works best. Note: No demonstrations with guns are included in this course, just discussions of their effectiveness. The videos and power points used in this course are up-to-date and rated by the leading bear experts as the best, information provided today. Videos are carefully selected according to whom the course is being delivered to – whether they may be workers in the bush, scientists, recreational individuals or younger students. Have had their confidence fortified so they can safely enjoy the outdoors without being overly fearful of bear attacks. Have learned to greatly reduce the chance of unwanted bear encounters. Appreciate and understand facts about bears and their habitat. Have fully enjoyed the course and come away with considerable knowledge on avoidance of unwanted bear encounters. A certificate of completion is provided to each student at the end of the course. It is valid for 3 years. Photo copies of tickets will be provided for employers' records. 35 years' experience of successfully handling several safe bear encounters. 23 years' experience as Forest Officer at the Ministry of Forest and several years as a trap line holder and trapper. Researched statistical data from over 35 books and publications on bear safety and almost all documented bear attacks in North America. Achieved 100% score on three different courses, including bear/wolf and/or Noxious animals and gun use. Assisted with training firearms in one course as a result. © 2014 LRM Enterprises Ltd.